When it comes to adorable packaging, you really can't beat Paul & Joe Beaute. Founded by French fashion designer Sophie Albou, her products are definitely the ones you'll want to have front and centre on your vanity. Each season, Sophie releases limited edition paper packaging to match the custom prints from her fashion line. It's a fun concept because it means you can switch your lipstick refill bullet from one case to another for something a little different. Another theme that regularly runs throughout Paul & Joe Beaute, and which I'm featuring in this post today, is cats. If you're a cat lover, prepare to want everything. For Fall 2016, I can't get over the Paul & Joe Cheek Colour CS105 "Chill in the Air". 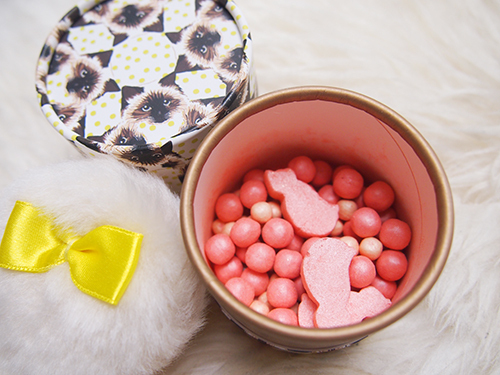 This limited edition product comes housed in a round cat-patterned container complete with puff. Inside are pearls of iridescent colour pigments, somewhat reminiscent of Guerlain Météorites. However, unlike the Météorites, "Chill in the Air" also contains little cat-shaped cheek colours. When you have makeup this cute, it can be incredibly difficult to bring yourself to use it. That's been the case with the Paul & Joe cat lipsticks I've been hoarding. 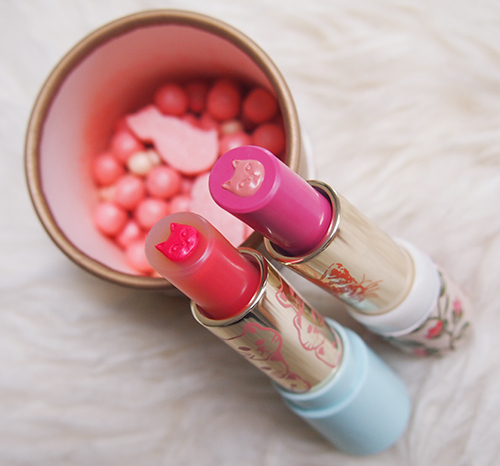 The lipsticks are formulated using a unique, Japanese candy-making technique called Kintaro-ame, which consists of two separate tubes (one columnar and one cat-shaped) to ensure the cat face shapes remain visible until the lipstick is used up. Unfortunately, the cat face etching will be wiped away once you use it -- one of the main reasons I have yet to even swatch these! Find Paul & Joe Beaute online at beautyBOUTIQUE.ca or select Shoppers Drug Mart beautyBOUTIQUE locations. Let me die and go to this cat heaven :D they all look magnificent, love Paul & Joe. OMG this is too cute! I love these. I don't think I could use them haha. I don't think I'm going to be able to either!